Deck up your homes with a traditional touch this Diwali. Adorn your rooms, shelves, floors and walls with bright and colourful Rangoli designs, idol show pieces, wall hangings and lots more! 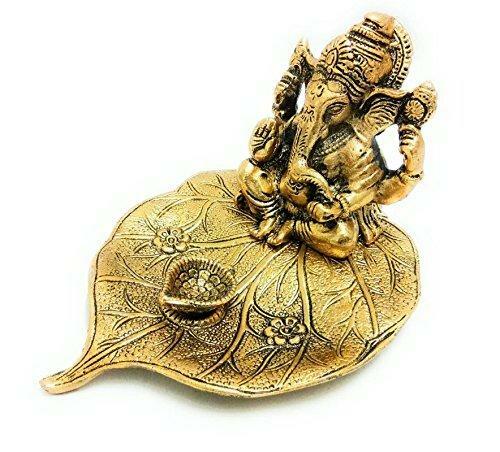 Handicraft Ganesha Sitting on Leaf with gold plated Diya – Carved from high graded white metal with oxidised gold finish, it is an exquisite piece of art! Lord Ganesha is detailed to perfection and is considered auspicious in all Hindu rituals and festivities. Lord Ganesha is comfortably seated on a leaf, the pointed end of which holds a diya with intricate patterns and designs. Place this amazing item at your Pooja Ghar to bring forth positivity and good vibes into the family. Rangoli Designs – Making Rangoli designs with coloured powders is a necessary activity by the womenfolk, however it is absolutely tedious and one needs to be cautious as the powders may get blown away with a gush of wind or if someone steps on it! We provide you with Rangoli designs that are ready-to-use and hassle free! These are made on a transparent plastic sheet with acrylic colours and a layer of glue underneath. These are absolutely handcrafted with bright colours and stones. These can be placed at the entrance of the main door to welcome the guests or on any floor or walls of the Pooja ghar. Place a diya at every end of the mango-shaped patterns to give it an extraordinary look. 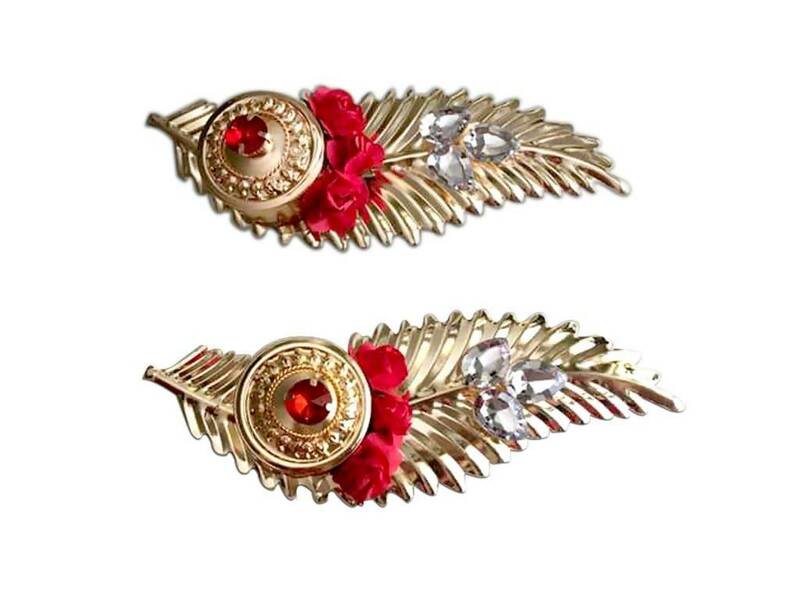 These are available in green, pink, red colours with mango-shaped, peacock-shaped and flower petal-shaped designs. Little Krishna (Gopal) decorated – Bring Bal Gopal to your Pooja Ghar or gift your loved ones a decorated Lord Krishna idol this Diwali. 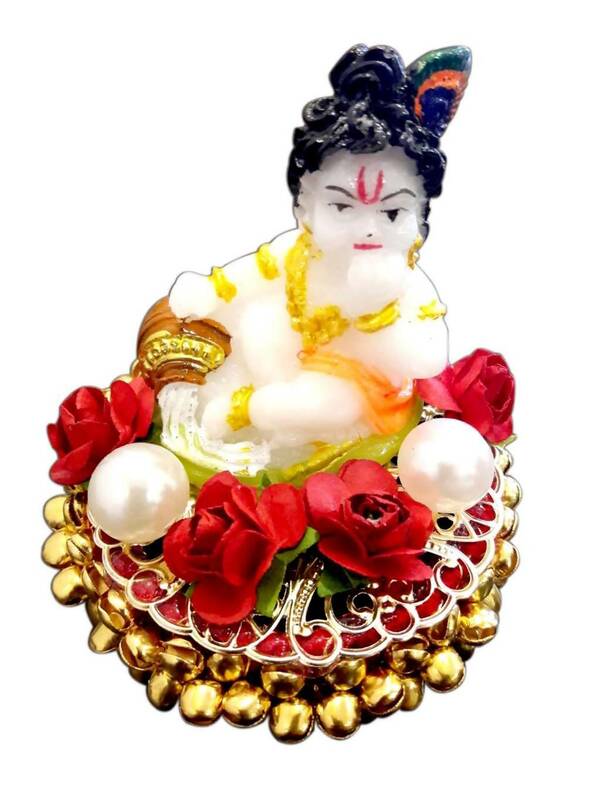 Made from white marble dust, Bal Gopal is seated on a golden throne-seat adorned with white and red flowers. Enhance the spirituality and auspicious aura at home with this beautiful yet light weight idol! Etikoppaka Wooden Home Décor Military Tank Toy – A toy for the kids that re-iterates the adventures of the battle field of history. 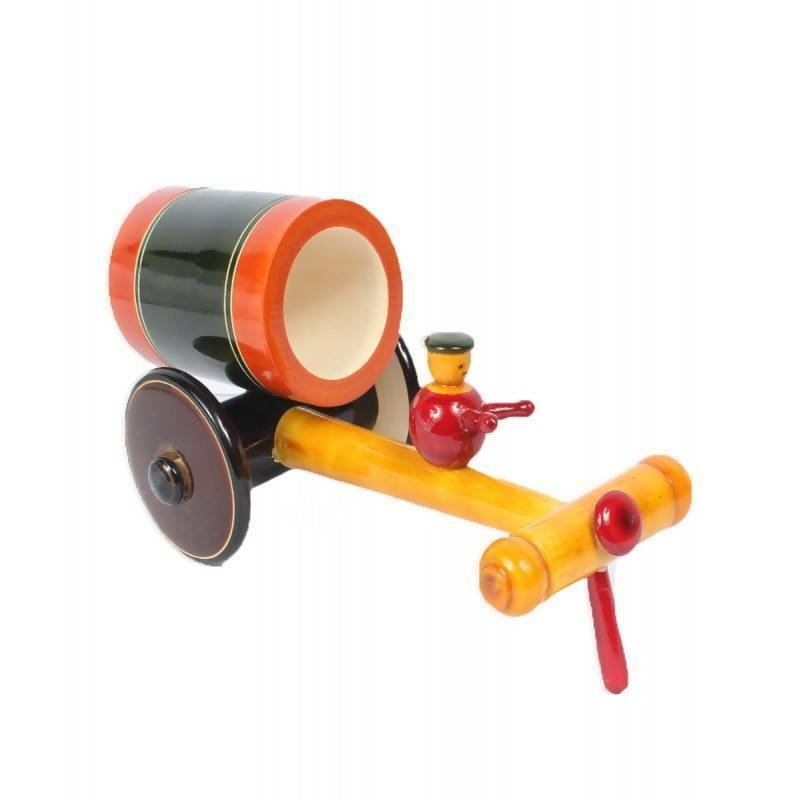 Carved from high quality soft and grained wood, it has a toy soldier which runs it on the black wheels. Noteworthy are its features, finish and colour perfection. Gift it to the munchkins at home or place it on the shelf to enhance the home decor this festive season. Handcrafted Ganesh Door Wall Hanging for Main Door/Living Room Home Decor – This amazing piece of art is made from wood, fabric and artificial items. It is absolutely hand made and the Ganesha idol carved from wood adds to the spiritual vibes. Beneath the Ganesha idol are artificial white pearls and beads that give way to a small silver bell. What adds to the stunning looks is the small white umbrella shielding the Ganesha idol! The umbrella looks absolutely cute with red and blue dots all over! 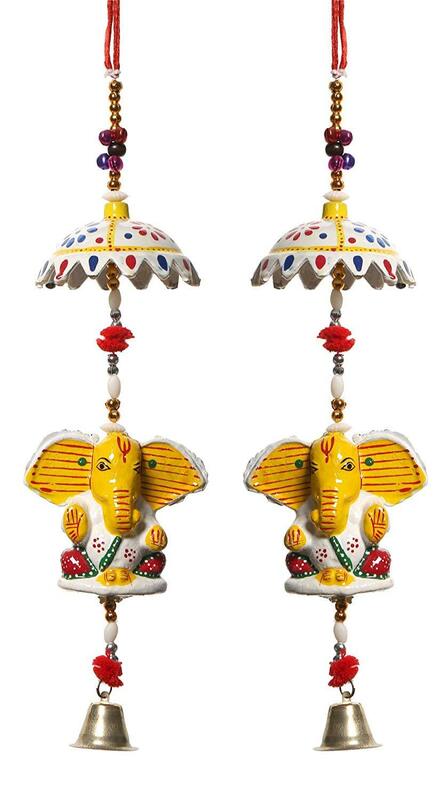 Most importantly, this door wall hanging of Ganesha comes in pairs! 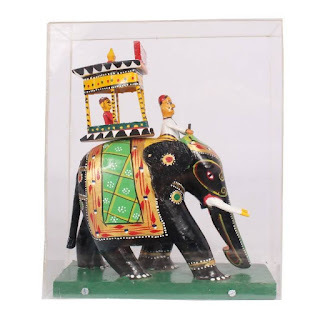 Kondapalli Ambari Traditional Elephant – Available in small, medium and large sizes, the Kondapalli elephant is quite popular among the residents of Andhra. These elephants are a part of historic story telling that are handcrafted to perfection. These are coloured with vegetable dyes, making these safe for children. The elephant takes a king on a ride while there is another figurine that seems to be guiding the elephant. The black elephant is adorned with golden jewellery and it is held firm on a strong base. Retain the colours and shine by keeping it away from water, clean with dry cloth only. 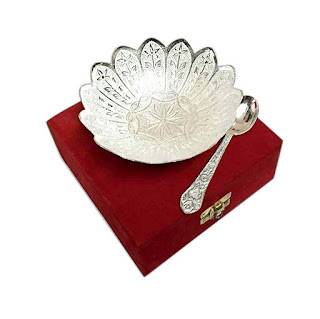 German Silver Flower Shaped Bowl With Spoon – Place cooked food or some dry fruits and sweets on the table while your guests arrive or gift the set of German Silver bowl and spoon on Diwali. Decorated with fine detailed patterns, it definitely adds glamour to the table! Leaf Shaped Kumkum Holder – Welcome your guests the Diwali way with this leaf shaped kumkum holder. This is also an exquisite piece of pooja accessory and can beautify your pooja temple. 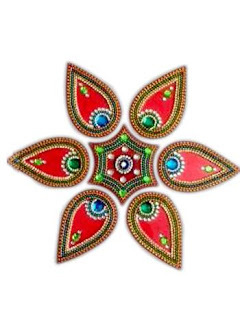 Kumkum holders are also known to be a traditional gift item on Diwali. Diwali home decor is supposed to add warmth to the house and make it more inviting. Bring a positive vibe to your home this Diwali, decorating it with the above mentioned traditional products.